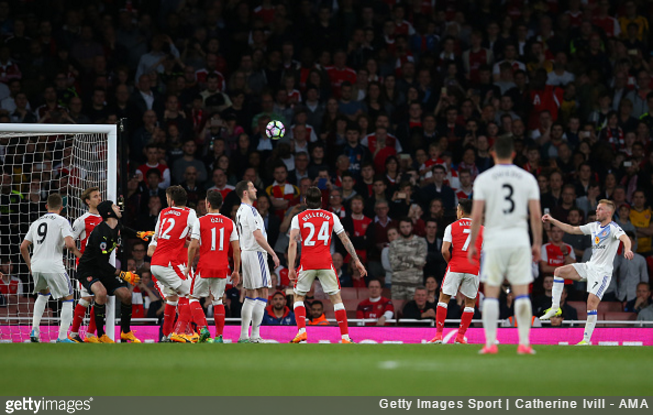 Tuesday night’s match at the Emirates saw one of football’s rarest phenomenons occur deep inside the Arsenal penalty area. A minute or so into the second half, Petr Cech was forced to handle a shoddy back-pass from Nacho Monreal, thus giving Sunderland an indirect freekick inside the 18-yard box. Of course, the Black Cats ended up blobbing it, but the results can certainly be spectacular when such set-pieces are dispatched emphatically – not that it tends to happen very often. Vilanova became the first ever player to score against a side managed by Jose Mourinho when he launched this direct free-kick up, over the wall and in off the underside of the crossbar.